Wholesale Epacris Plants are available from growers in a number of varieties. Epacris are widely used in landscaping and are suited to mass planting. Available in sizes from tubestock to 14cm and 25cm pots depending on variety and grower. 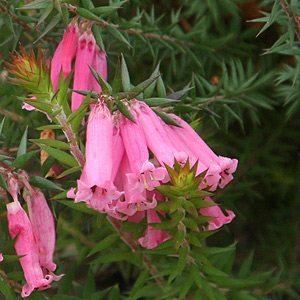 Epacris are a group of evergreen native plants sometimes called Australian Heaths. They are a tough plant with Epacris impressa being one of the more popular species. Although promoted as garden plants,many varieties are also well suited to container growing. Epacris impressa is available in both pink and white flowering forms, flowering from late winter to spring. A small shrub to around 1m. This is thee floral emblem of Victoria. Epacris longifolia with its elongated tubular flowers will reach around 1 – 1.5m in height. Lipstick red to pink flowers with white tips. Both species prefer a cool root run, part shade in hot climates. Flower Colour – White and Pink. Size – To 1m with a spread of .5m. Full sun to part afternoon shade. Mulch to maintain a cool root run. Low phosphate fertiliser in spring.